The Crac des Chevaliers and Qal'at Salah El-Din are the most significant remaining examples of fortresses dating from the Crusader period. 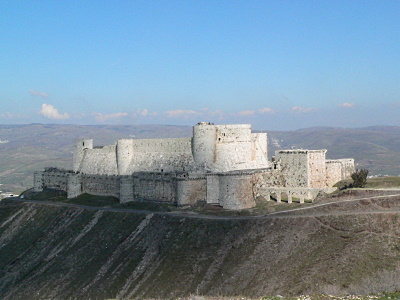 Crac des Chevaliers ("fortress of the knights") was the headquarters of the Knights Hospitaller in Syria during the Crusades. The Hospitallers in 1144 rebuilt the original fortress dating from 1031 and expanded it into the largest Crusader fortress in the Holy Land, adding an outer wall 3 meters thick with seven guard towers 8-10 meters thick, to create a concentric castle. I have visited also both places in October 2010. The easiest way to get to Crac is bus minibus from Homs (check the latest but they should depart from main city bus station, normal place costs 50 SYP (but this counts when car is full), we paid (ad hoc group) 150 SYP each which is still not bad (around 3-4 usd). On a way back - just take any of awaitng buses - they gather just outside the main gate. If you wait for a while you should pay around normal price. The best view of the castle itself is from the nearby hill just follow the road from the main gate. There is a possibility to leave the luggage by the ticket office. To get to Saladin's Castle: it is good to arrange a normal minibus from Lattakia (from the place close to main bus station), if you are with a group after some negotiations the driver should take you directly to the castle (price for both way should be around 1000-1200 SYP), if you are a good negotiator it may be less. For both places there is also a possibility to arrange a taxi prices are much bigger (but still acceptable I guess) or a package tour from Homs, Hama or Lattakia based agencies. Crac des Chevaliers meets my idealised vision of “Medieval Castle” more than any other I know of. Its skyline and isolated location are incomparable and it is a worthy addition to a list which is already overfull of (often more average!) military structures. The inscription also includes another of Syria’s many castles left over from the period of the Crusades - Qal’at Salah El-Din (Saladin’s Castle). In fact it was only given this name in 1957 to honour the sultan who conquered it in 1188 (Previously it was the “Fortress of Sayun” or “Chateau de Saône”). This perhaps highlights the tensions in how Arabs view Crusader castles – even the names are often associated with the European invaders! In fact the history of their design and use is rather more complicated. To get over the problem the ICOMOS evaluation rather piously states “The stones of these castles, which testify to the confrontation of two different conceptions, two different religious traditions, are now testimony to coexistence, exchange and interaction, a place for peace and culture, a monument for human genius”. Well – possibly/hopefully!! We visited both castles in 1999. Crac is the better preserved and has plenty of dark rooms and corridors to explore. However to a non-specialist in military fortifications the outside views of the castle are the more impressive – though the views of the surrounding mountains from the ramparts are also very fine and emphasise its wonderful defensive location. The walls of Saladin’s Citadel spread further but there is less to see both inside and out – a particular sight however is an enormous gorge cut in the rock to strengthen a weak defence on one side. This is big enough for the road to the castle to run through it. In the middle the remains of a high pillar which was part of a drawbridge connecting the 2 sides can be seen. My strongest memory of our visit to the castle was seeing all the wild cyclamen growing in the surrounding forests and ravines (we were there in April). This was another 2006 addition where, despite accepting the validity of the proposed criteria for “outstanding universal value”, ICOMOS recommended referral rather than inscription (and was presumably overruled by WHC). In particular it wanted assurances that planned cable cars to the 2 sites would not be built - even in the buffer zone!! As I remember these sites in their glorious isolation with no other tourists around I give thanks again for having been able to see them at what might well be an optimal era – relatively easy to get to (we had a rent-a-car) but not too much so! P.S. I feel a “WHS Trivia” list coming on - “WHS with Cable Cars”! Can anyone help? UNESCO has been very critical of new cable car suggestions but a number seem to have slipped through in the past! So far (2/8/06) the following 13 have been suggested as "candidates" (though it is not always possible to tell if they are situated within the core or buffer zones) – Mt Taishan, Mt Qingcheng, Mt Huangshan, Wulingyuan (They seem “de rigeur” in China! ), Masada, Upper Middle Rhine, Pavaghad, Jungfrau, Budapest, Macao, Grt Blue Mtns, Kii Mtn, Valparaiso (Projects have also been suggested for – Jerusalem, Machu Picchu and of course Crac) . Damaged in War since WWII: Syrian Civil War. "By October 2013, numerous craters appeared at Crac de Chevaliars, including one on the south turret's roof.The AAAS report describes moderate structural damage to the castle, including to its southeast tower and three visible craters to the northern part of the castle." Knights Hospitaller: Was the Knights Hospitaller HQ during the Cruusades and was expanded between 1150-1250 and eventually housed a garrison of 2000. Saladin: The 2nd castle making up this site is called Qal?at Salah El-Din. The AB evaluation states "..the Fortress of Sayun (Ch?teau de Sa?ne) was renamed Fortress of Saladin in 1957 to honour the sultan who conquered it in 1188". The earlier name arose because, although the castle dates back to ancient times, "It then fell in the hands of the Crusaders at around the beginning of the 12th century. It is mentioned that in 1119 it was owned by Robert of Saone"
Ibn Battuta: "From Tripoli I went inland, via Hisn al-Akrad [Crac des Chevaliers] and Hims, to the town of Hamah."